In celebration of Superior Spider-Man’s “Goblin Nation” arc, over the next two months, I’m going to acknowledge what I consider to be the 10 best Green Goblin/Spider-Man storylines. I’m creating this list based on a full array of arbitrary, unscientific criteria: namely historical significance, artwork, creativity and my overall enjoyment of the story. Who am I kidding? I can’t even keep this charade up for more than a sentence. As painfully obvious as this selection ended up being (I first considered doing this list late last year when I heard about “Goblin Nation” and I knew this story would be No. 1 and it was just the other nine entries up for debate), I’m actually at a bit of a loss to provide this storyline with the insight it deserves. At least any original insight. You’ve heard this all before: Gwen Stacy’s death “changed” comics. It marked the “end of the Silver Age.” It was the “end of innocence in comics.” Anytime I refer to this storyline, I feel obligated to qualify it by using one of these phrases, sometimes all three at once. 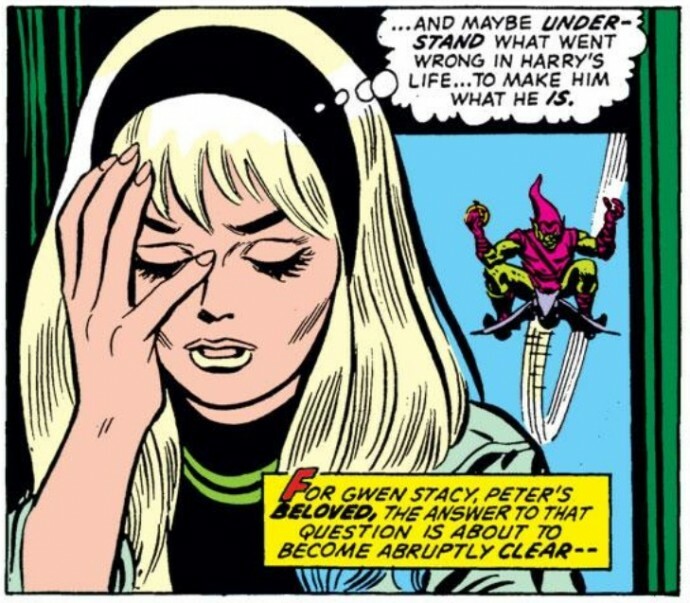 The world of critical analysis is often filled with hyperbole, but in the case of “The Death of Gwen Stacy,” I think these statements are accepted at face value. As a collector, these are two of my most valuable comics. Yes, there are a handful of Silver Age issues that are technically “worth” more in terms of dollars and cents, but outside of a miniscule number of Stan Lee/Steve Ditko issues, are there any as important as ASM #121-122? Again, you’ve heard this kind of stuff before. You’re probably asking yourselves, what does Mark actually think about these comics? What do I have to say? Comics like these two are hard to write about because it presents me with a chicken and egg scenario: do I really, really love these comics and thus consider them to be historically important, or are they historically important and that’s why I have to love and appreciate them. There was a period not so long ago, where to be slightly contrary, I mentioned I thought Gwen’s death in ASM #121 didn’t have the appropriate amount of build. But that’s a crap opinion. It’s an event that’s designed to shock and disarm. It’s supposed to demonstrate how fleeting our innocence can be. How a character can be a part of our universe for so long can just disappear without a moment’s notice. As much as I love Brian Michael Bendis’s work on Ultimate Spider-Man, if a story like “The Death of Gwen Stacy” was as gradually built out like a Bendis tale, the impact of her eventual death would be lost. I do continue to maintain that while ASM #121 was the more “important” issue in terms of historical impact, ASM #122 is the “better” comic in terms of the story it tells and its characterization of its key players. That’s why when I conducted my top 10 single ASM issue countdown last year, ASM #122 ranked quite prominently. For me, ASM #122 captures everything I absolutely love about Spider-Man. Since his inception, we’ve seen him realize the errors of his ways in Amazing Fantasy #15, we saw him overcome impossible odds in ASM #31-33 and we saw him stay true to his responsibilities as a superhero in stories like ASM #50. But we never actually saw him deal with using his powers in the face of incredible tragedy. Spider-Man has been given every reason to confront Green Goblin and snap his neck, Hal Jordan to Sinestro style. And for a while there in ASM #122, the reader is led to believe he will do just that. But even in the face of the Goblin’s unprecedented evil and callousness, Spider-Man does the right thing. He beats the Goblin pretty handedly, but stops himself before he can deal a fatal blow. And then he acknowledges that despite his anger, despite his rage, he can never intentionally cross that line. 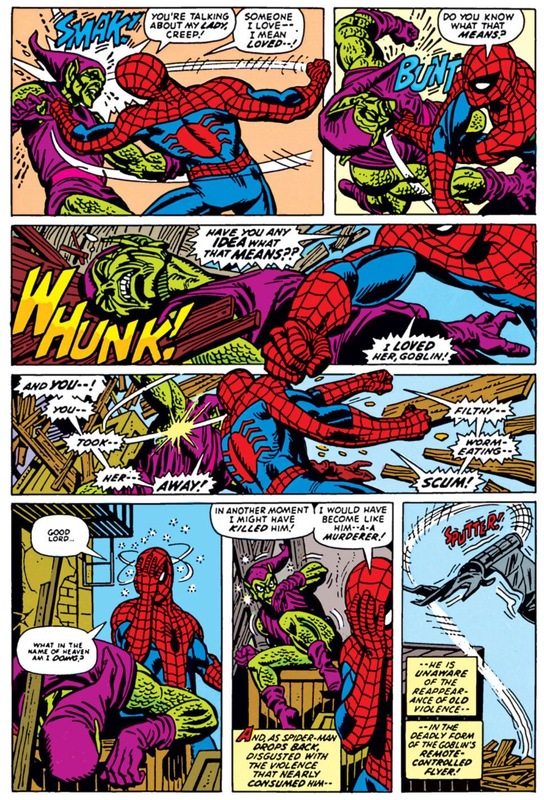 When the Goblin inevitably impales himself on his glider, Spider-Man thinks that his death should have “meant more.” This might be the most interesting reaction Conway scripts in this storyline. I’ve gone back and tried to interpret that comment numerous times. I always wonder what would Spider-Man have preferred. He already understood that he could never be the one to deliver the death blow to Norman, but then what would have given the goblin’s death more meaning? Of course, for the longest time, Norman’s death was one of the big ones that seemed to stick. And then he was resurrected at the end of the “Clone Saga” in a story that I actually ranked pretty robustly in my list. 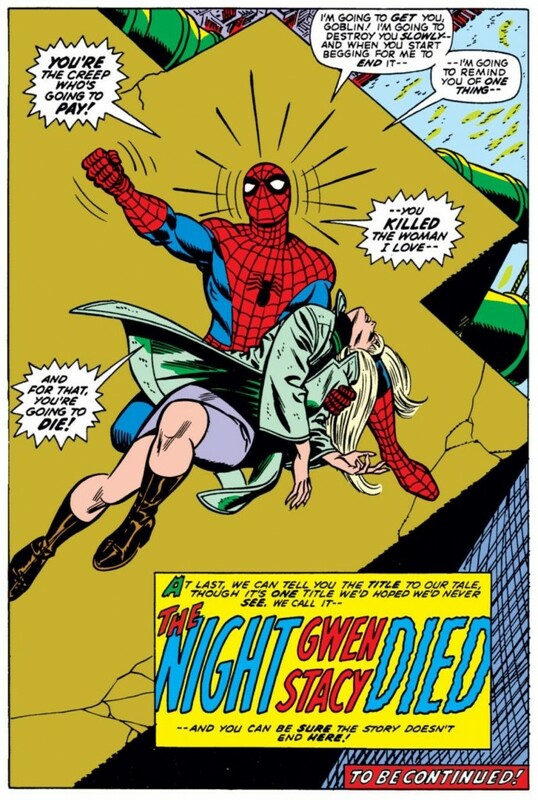 For the longest time, I viewed “The Death of Gwen Stacy” to be such a sacred story, I would never consider defending the retcon of anything from it, especially the return of Norman (and let’s not even suggest Gwen’s return. I have issues enough with her clone walking around in subsequent stories). But as is often the case, as I’ve gotten older, I’ve found myself to be less reactionary and more tolerant of stuff that would have offended my sensibilities years ago. As far as I’m concerned, as long as they didn’t retcon the fact that Peter actually killed a clone of Norman, or that an alien stopped time and replaced Norman with a body double the millisecond before the glider made impact, I’m okay with Osborn’s presence in the Marvel Universe. Plus, he did end up serving a purpose, as a decent chunk of my list involves post-ASM #122 Norman stories. On a slightly tangential note, as I’ve expressed before, Conway ends his script with what may be one of my favorite Spider-Man comics moments ever. 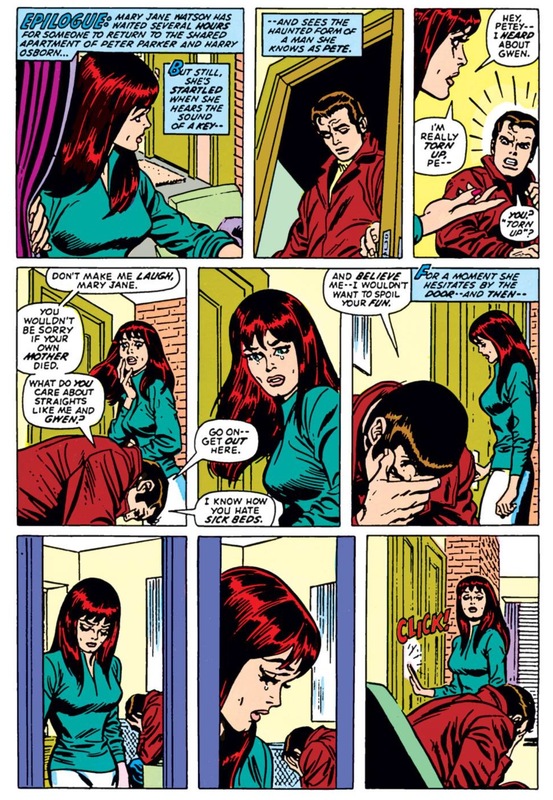 Peter is in tremendous mourning when Mary Jane walks in, and he immediately shoos her away, dismissing MJ as a party girl. But instead of running away as she always did in the past, Mary Jane closes the door and provides support for Peter. The scene obviously opens the door and plants the seed for a Peter/MJ relationship (though Conway has said he never wanted to marry the two), but it also adds a layer of depth and richness to Mary Jane. In one fell swoop, she was transformed into one of the best supporting characters in the history of comics. What else can I really say about “The Death of Gwen Stacy?” Do you need me to debate the “snap” again for the hundredth time (a debate that probably surpasses Han/Greedo shooting first in terms of hang-wringing)? The fact that the text of ASM #121 lists the George Washington Bridge rather than the Brooklyn Bridge? Not to cop out, but listen to the Superior Spider-Talk podcast’s interview with Conway if that’s what you want to hear me talk about. This was unquestionably the most ambitious top 10 list I’ve ever tackled. I feel like I spent months of my life reading and re-reading and trying to bring some fresh perspectives to the table where possible. I’d be more than willing to do something like this again, though I just don’t know if I could ever replicate the depth and breadth of this list with another Spider-Man villain. 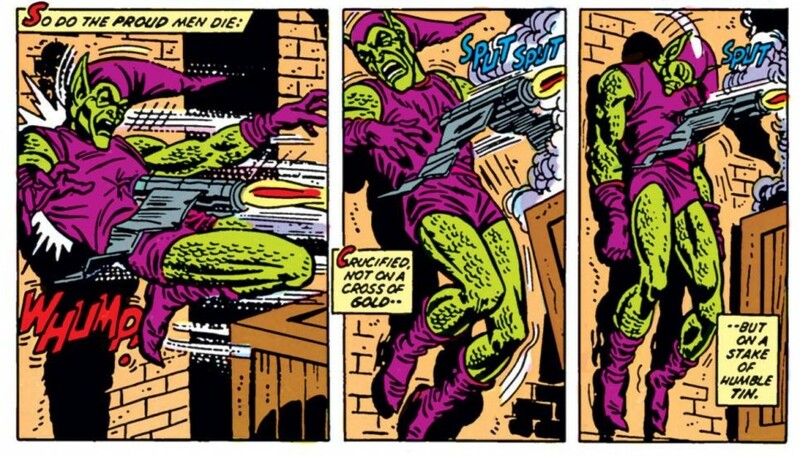 Doctor Octopus certainly can stake a claim to being Spider-Man’s arch foe, but frankly the Goblin has just been the figurehead in the better, more historic stories in Spidey’s career. Going back and re-reading all of these stories has convinced me of that. 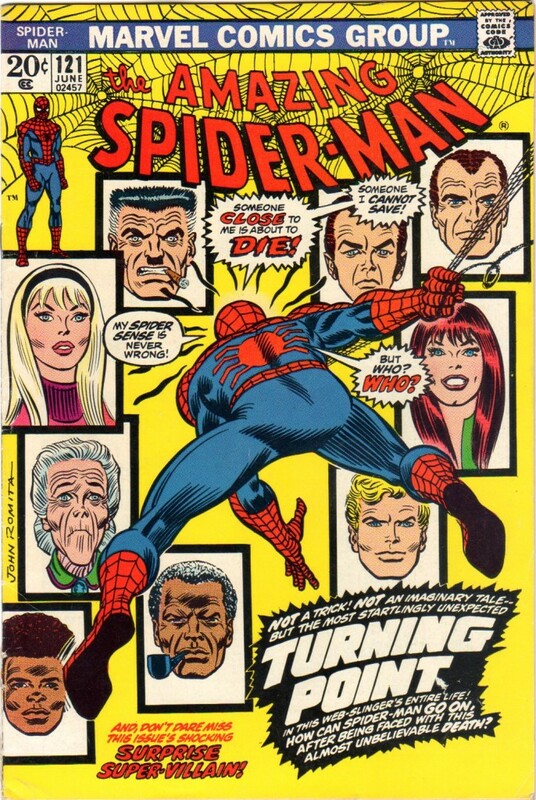 Over the course of April, I plan to tackle a few more Goblin-related storylines from the past (when you see what I’m talking about, you won’t object to the fact that they were not considered to be a part of my countdown) and I also want to acknowledge the 50th anniversary of the great Daredevil by giving you my take on some classic Spider-Man/Daredevil team-ups in the past. Also, with a certain First Avenger starring in a movie later this week, don’t be shocked if some content related to that makes its way onto the site. As always, thanks to all of you for the support. You are the reason I keep doing this. Whether intended or not, a great April Fool’s Day way to start off your post! But you are right, your real #1 entry is classic in every sense if the word. Awesome list, sir, well-written and defended. Despite my charge that Spectacular ish 2 should have been higher up, very well done. ASM 122 was one of my first issues, bought at a store back in ’73 (I finally tracked down a VF+ copy of ish 121 a couple of years back..). The only other ‘Conway-incongruity’ that stemmed from this was of course the ‘Who removed the Goblin costume?’ debate. At one point (in ish 123..?) Peter said he did.., then later he mused ‘Who removed his costume?’.. which apparently Harry admitted to, I can’t quite recall. Agreed that Ish 122 was definitely the better issue of the two, I was very disappointed when the Clone storyline started.. ‘Marvel Universe science’ for what it’s worth, just didn’t seem to support a college professor doing cloning at that point. Perhaps it could have played better in the pages of FF or X-Men, but in Peter’s little world of ASM..? It just didn’t sit right. I read the ‘Untold Story’ book where Lee insisted Gwen be brought back ~ That was such a wrong move. It was such a contrived slap in the face for every reader who cared about Peter Parker. Perhaps one of the reasons I finally stopped collecting back by 1975. I’d actually really like to see a Doc Ock list to give me some reading material. As someone who has flitted in and out of Amazing, for some reason I don’t feel like I’ve read many memorable stories starring him and it’s always confused me that people occasionally rank him as Spidey’s arch-nemesis. This is surely ignorance on my part, but he always seemed more on par with guys like Lizard and Kraven. I realize most Spidey fans would shoot me for saying this and it’s clearly because I’m a child of the ’90s and more a video game/cartoon kid than a comic reader, but after Goblin, Venom always seemed to me like Spider-man’s greatest nemesis. It is a great list. I also second a Doc Ock list too! I think that too many people write him off as a tubby fat guy. OK, that’s two votes for a Doc Ock list, though I’m warning you … if I did one my ranking of the original Master Planner saga is going to shock people, not because I dislike the story, but because he’s so non-essential in it IMHO. That was a greay enjoyable list to read and anslyze. Keep up the excellent work. Wonderful list. I looked forward to the post each week. Here is a third vote for a Doc Ock list. I did not agree with your list in its entirety, but that is half the fun of reading an article of this nature! I own a nice copy of 121, but now I must own 122, too! I might need Doc Ocks assistance to get my hands on a copy! Thanks for your hard work and this fun web site.